Contenders from Team Lea now fight for the six slots of Top six going to Live Shows in The Voice of the Philippines Season 2 on January 11, 2015. The first team consisted of three singers who were more of the classical genre. Timmy Pavino singing his rendition of ‘Narito’. He dedicated his song for his grandmother. Lea said that he should just let his emotion flow. Charles Catbagan on the other hand chose ‘Kahit Isang Saglit’. The coach said that he must always be connected through the song. Leah Patricio sang ‘Bukas Na Lang Kita Mamahalin’. Lea shared how she was amazed during the rehearsal. Timmy’ rendition of ‘Narito’ brought all smiles to Lea. She cheered on for him while Sarah seemed speechless. Charlie had easily connected with the emotions of the listeners. Lea seemed proud as she was made emotional and clapped gracefully. Leah also made her coach cheer in delight as she reached her high notes without fail. Sarah said that among the three traditional singers, Leah did the best. Bamboo agreed with her while Apl said Charlie did the best among the three OPM performances. Lea Salonga decided that Lea and Timmy should stay for their Live Shows. 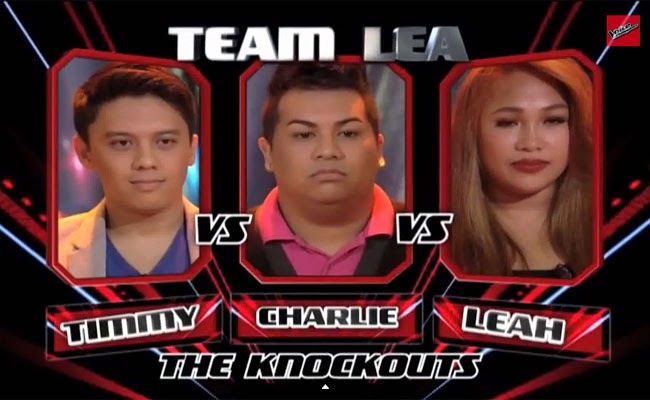 Timmy Pavino and Leah Patricio will move on to the next round of the competition as part on the Team Lea’s Top 6.